It was only last year that Zhang Ke Jia's sad, sedate, occasionally whimsical little masterwork, Still Life, landed on American shores. And here we are again with another difficult, gorgeous film, 24 City, that continues to express both Jia's profound affection for his countrymen and his ambivalence towards China's modernization. Here Jia adopts a blended documentary-fiction approach, wherein his camera explores the ruins of an munitions complex as it is transformed into luxury high rises, and interviews former factory employees and actors posing as employees. 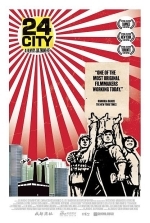 Even more than Still Life, 24 City is a film enamored--in a mournful sort of way--with the industrial and post-industrial spaces of China, echoing Jennifer Baichwal's ominous and beautiful documentary, Manufactured Landscapes. The wondrous enigma of Jia's talent is evident here, manifest in his blending of cool observation and authentic, piercing emotion. Grave and challenging, 24 City is a testament to the director's novel vision, a succesion of sensory pleasures that prods expectations. Oddly enough, perhaps the most perplexing aspect of the film is its "Ocean's Twelve moment": the use of Joan Chen to portray a women who is known for her resemblance to Joan Chen.